Spanish Baroque painter Bartolomé Esteban Murillo's 400th birth year has been marked with a Google doodle on 29 November 2018. 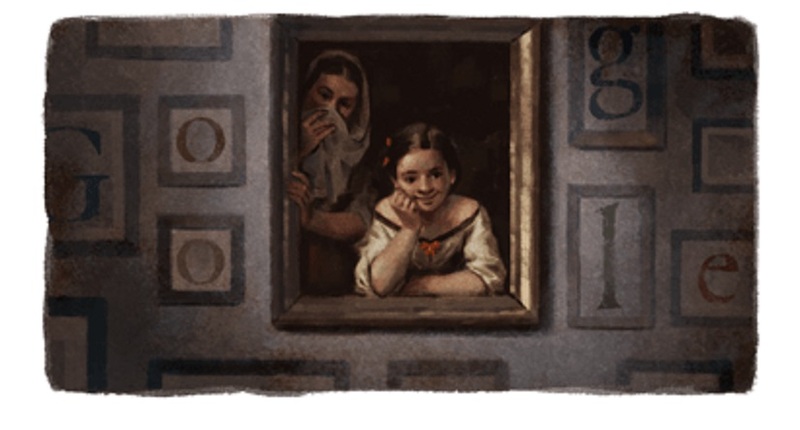 The doodle depicts one of Murillo's iconic paintings: 'Two Women At A Window', painted circa 1655-60, and currently in the collection of the National Gallery of Art, Washington DC. Murillo Born in Seville in late December 1617 (the exact date is unknown, although he was certainly baptised in January of 1618), Murillo began learning art under his uncle. The J Paul Getty Museum notes that young Murillo would sell his devotional images at local fairs. Later, he served as an apprentice to other artists. His early paintings followed a highly realistic style, and encompassed predominantly religious subjects (as was the convention at the time), and he had his first major successes by 1645. Murillo also began painting scenes of everyday Andalusian life: urchins and people on the street, portraits that were highly idealised, and characterised by the soft luminosity that marked so many of his canvasses. 'Two Women At A Window' — the painting used in the Google doodle to commemorate Murillo — is a wonderful example of his oeuvre: of the two women, one is young, the other considerably older. The older woman covers her mouth with a cloth, seemingly stifling her laughter at the scene unfolding outside the window. The young girl looks on at the same scene with a smile; there's a wistful expression on her face, perhaps indicating she wants to join in the fun outside. At one time, the Getty Museum notes, "the market for Bartolomé Estebán Murillo's pictures was so large and lucrative that the king refused to allow their export from the country. Murillo himself never left Spain." Of particular note were his renditions of the Immaculate Conception, a cornerstone of Baroque painters. Murillo died in Seville in 1682. He had produced over 400 paintings in his lifetime, and mentored many pupils. The 19th century saw the popularity of his art — deemed "overly sentimental" and "kitschy" — nosedive. However, there has been a renewed appreciation for his contributions to the world of Spanish art, and his skills at portraiture and as a draughtsman. Several exhibitions of his work have been organised to mark the 400th centenary of his birth.